Wanted to have “planned-overs” for lunch on another day--not enough time before lunch to cook a stew, plus a busy day, plus maybe more clouds than today. 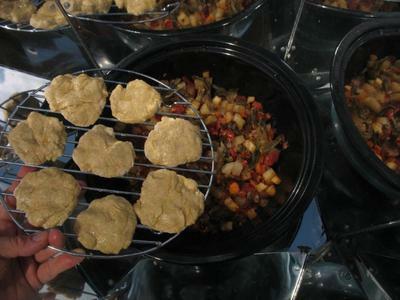 So when I wrote the recipe for Sunshine Stew, it was very early May--pretty early in the “Solar Hot Pot Cooking Season.” It took about 6-7 hours for the stew to get done. Well, now of course it is mid-August, with a higher sun. Put the stew in at 10 am, and it was done around 2:30 (4 1/2 hours)! The other stew--I had been wanting to do flat bread anyway, so around 2:30 we popped a baking rack full of flat bread right on top of the stew. We figure this will immediately slow the cooking down, since we let out heat to get the rack in. Also, the bread needs to bake now, and it will “take up” some of the heat. The flat bread looks a little anemic, but it’s pretty much cooked through. 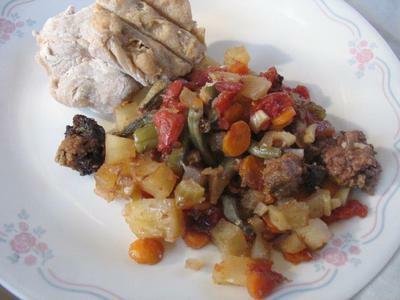 (smile) It’s a great combo together--flat bread and stew. I wouldn’t try stew & flat bread in the same Hot Pot on spring or fall or partly cloudy days, but this worked out better than I thought it would on this nice, mid-August day. I love solar cooking!!! If I had had more energy, I would have cooked up something else in the other Hot Pot since the planned-over stew got done so fast! In any case, it looks like I need to go through my recipes and adjust the ones that are more “sensitive” (like cooking potatoes and things that can get overdone). It seems like mid-summer, high sun will mostly affect the longer-cooking recipes. Leaving that stew for 6-7 hours with no flat bread on a day like today would probably have turned it to mush! If all goes as planned, recipe 42 coming next week!